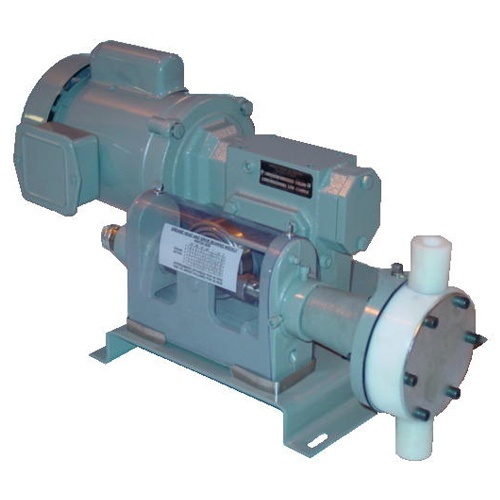 The V-10-H is a heavy duty hydraulic diaphragm metering pump built for minimum maintenance from quality materials. The pump end of the unit utilizes a precision inline machined casting for minimum wear and strength. The pump is driven by a continuous duty oil filled speed reducer which is available in several ratios for the required stroking rate. The wet end of the pump is precision machined and utilizes a ground stainless steel piston to displace oil which in turn flexes a diaphragm. The output of the pump is varied from zero to maximum by manually adjusting the piston stroke length or, automatically with a variable speed motor and controller option.